Roundhouse matt lacquer Urbo handleless bespoke kitchen in Dulux 20YY 650 48. Bespoke colourblocked glass splashback. Worksurfaces in polished Silestone Altair. Extension by Paul Wiggins Architects. Ral colour of sliders on extension? - Love the colour of the glass extension - so much better than standard black of grey - any idea what RAL colour this is? Thanks. Roundhouse designed the kitchen only and has limited details of other aspects of the design. We love to help when we can if we have access to the right information. Being bespoke designers and manufacturers of kitchens we can answer questions about the kitchen cabinetry and appliances. Sorry I can’t help further on this question. 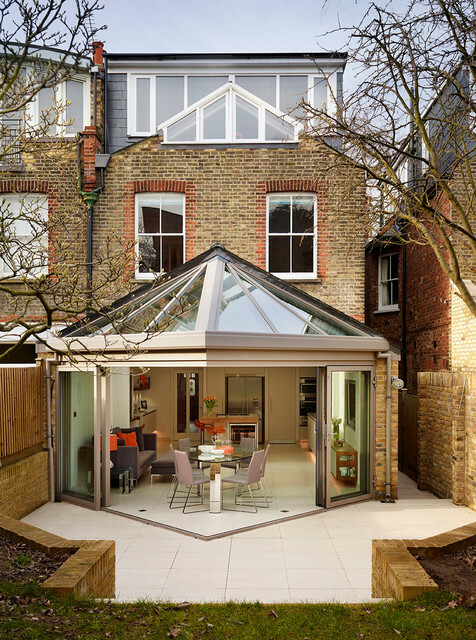 Looking for an apex roof lantern like the one here. - It's the one in the roof, not the conservatory I mean. Do you know any stockists? We can manufacture, supply and install these roof lights to meet your bespoke requirements. Thanks, Matthew - Design Bifolds. cabinetry and appliances – sorry! Who do I need to contact to design a conservatory like this one? - I am looking to build a contemporary style conservatory to replace the one that is already there. Hi, This one was built by Paul Wiggins at http://www.paulwigginsarchitects.com. Hope this helps. Be prudent‘You can easily go overboard with extensions,’ warns Jerry Evans. ‘Throwing lots of money at it doesn’t necessarily mean you’ll get it back. Value added depends on where you are in the country. Where space is at a premium, of course it will add more. But it’s quite a dangerous game if you don’t know what you’re doing,’ He advises speaking to a local estate agent to get a rough valuation of how much they think it will add, and factor that into your budget. ‘It’s important to assess your property in relation to its location,’ adds Hugo Tugman. ‘It might become the most expensive property on the street, but it will reach a ceiling value.’TELL US…Have you extended your property? How did it go for you? Share your experiences and photos in the Comments below.